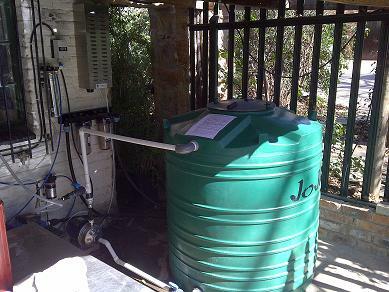 This water treatment facility was installed at Casalinga Restaurant outside Johannesburg where they bottle their own water to sell in the restaurant. The water originates in an underground well or borehole. This water passes through a 10 micron and then a 5 micron cartridge filter before filling the 1000L storage tank. The water is circulated in the storage tank for an hour with ozone before being bottled. The ozone generator system is run using a pressure pump which forces the water through a restriction called a venturi. The venturi has an opening near the restricted passage which allows for air to be sucked in from outside. This phenomenon occurs due to the pressure differential between a high pressure system (before the restriction) and a low pressure system (immediately after the restriction) which causes a vacuum. Ozone is manufactured by corona discharge in the ozone generator and this ozone is introduced into the water by being sucked in via the venturi. The ozone kills 100% of all viruses and bacteria found in the water and renders the water, as well as the storage tank, completely sterile and ready for bottling. A carbon filter is installed just before bottling since the taste of the water is affected by carbon filtration. Carbon removes any residual ozone and other metals or chemicals possibly present which could affect the taste of the water. This type of water treatment system is very affordable and 100% effective in the treatment of potable water.